This title will be available Spring 2017. You may place an order and the item will be shipped when it becomes available. Since its publication, thousands of catalogers, technical services librarians, and LIS students have benefitted from the expert guidance provided by El-Sherbini’s guide, which won the 2014 ALCTS Outstanding Publication Award. In this new edition, she completely updates her text to reflect the maturing landscape of RDA: Resource Description and Access. Customers in the U.S. and Mexico purchase here. Customers outside the U.S., Canada, and Mexico purchase here. In this clear and comprehensive resource, cataloging expert Robert Maxwell brings his trademark practical commentary to bear on the new, unified cataloging standard. Designed to interpret and explain RDA: Resource Description and Access, this handbook illustrates and applies the new cataloging rules in the MARC21 environment for every type of information format. Customers in all countries purchase here. Libraries are increasingly using web-scale discovery systems to help clients find a wide assortment of library materials. Depending on the library material cataloged, the discovery system might need to negotiate different metadata standards. In Managing Metadata in Web-scale Discovery Systems, Spiteri and a range of international experts show you how to maximize the effectiveness of web-scale discovery systems, provide a smooth and seamless discovery experience to your users, and so much more. We now catalog in a post-AACR2 world. RDA: Resource Description and Access is designed to cover all types of content and media, but communities of practice are still evolving for motion picture and video materials. This handbook clarifies the protocol for DVDs and Blu-ray discs, expanding upon established guidelines for AACR2 and integrating them into the new standard. This title will be available December 2017. You may place an order and the item will be shipped when it becomes available. As the transition to RDA: Resource Description and Access changes the international cataloging landscape, readers need practical guidance to operate successfully in a world of hybrid catalogues, where records created under different standards coexist. This highly practical guide draws out the flexibility offered by RDA and the scope for cataloger judgment in balancing flexibility with consistency of entry. Customers in the U.S. and Canada should purchase through the ALA Store. Customers outside of the U.S. and Canada should purchase through Facet Publishing. 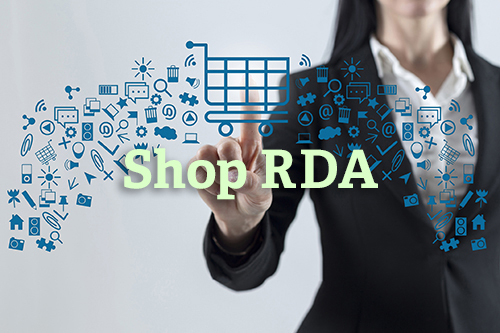 A specially-priced bundle that includes the publications described above--Introducing RDA: A Guide to the Basics and Library Technology Reports, Understanding the Semantic Web and RDA Vocabularies. Customers in all other countries purchase the bundle here.